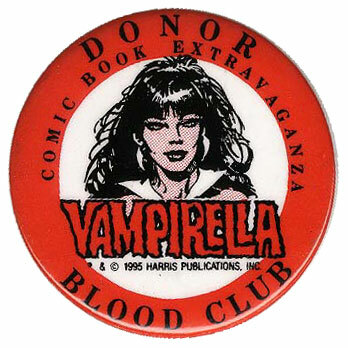 This is the "Donor Button" from the first Vampirella Blood Drive held at the Comic Book Extravaganza in New York City in 1995. It bears the copyright and logo of Harris Publications. This badge was part of a package of exclusive premiums available only to blood donors! You had to donate blood in order to get one and only 150 were made. It measures 2 1/4" with a great illustration of Vampirella by artist, Gonzalo Mayo. 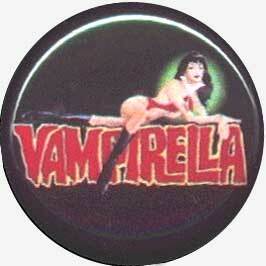 This is a lovely little Vampirella Logo cloisonne badge, with red enamel on a "brass" coloured metal backing. The back is marked COPYRIGHT © 1996 HARRIS PUBLICATIONS INC., and I believe it was issued as part of the membership pack for the Scarlet Legion. The scan above is full size - 1.25 inches/35 mm. wide. 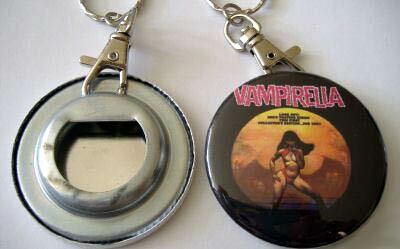 'theno1badgemaster" also supplies 2.25 inch / 55 mm badges, key rings, bottle openers (below), fridge magnets and make up mirrors with the same Vampirella image on the front - see example bottle opener/key ring combo below. These items are also available with as a whole range of other rock, pop, goth etc. pictures on them. This pin back badge was issued by Harris Publications as part of the Scarlet Legion Fan Club membership pack. If you weren't a member of the Scarlet Legion you could not get one! The picture is from a Vengeance of Vampirella issue. The picture is from the classic Joe Jusko cover from Vampirella 21. This small badge (or button as it is usually advertised) comes up fairly regularly on eBay. It is quite small (hence being sold as a "button"). I am pretty sure it is not an official Harris product. Not exactly a "badge", but a patch. This is a current offering on eBay and is quite a well made fully embroidered sew-on badge/patch about 4.5inches/11 cms. from boot tip to top of head. Vibrant and colourful it shows Vampirella from her "Vengeance" period. This eBay seller has made a nice cluster of Vampirella images using some lesser seen, but nevertheless attractive, images. Again, I am pretty sure they are not official Harris licensed products. 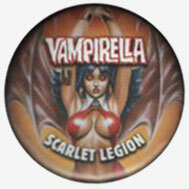 Another enterprising eBay seller has a range of badges featuring our Vampirella. Very kindly his scan includes a tape measure to show their size. You have to love eBay for finding the weird and wonderful, not to mention being able to cash in on current affairs. Leading up to the historic 2008 USA Election in which Barack Obama became the first black President, two Vampirella badges were available via eBay, identical apart from the names on them. Hedging his bets the seller had both Obama and McCain badges. I wonder which one sold most?